Elmbrook wanted to make a change in the way they approach education, shifting from ‘one-size fits all’ to fulfilling a commitment to personalized learning for every student. Elmbrook’s extensive search for a portfolio solution led the district to FreshGrade. Using FreshGrade they have given students the tools to reflect on and take ownership of their academic growth; made student work in the classroom visible to parents; and have found success enabling teachers with easy to use technology that solves real classroom challenges. The challenges school district leaders face are diverse and vital to the success of students, teachers, and schools. According to K12 Blueprint, infrastructure, access, devices, data, and platforms are current educational priorities for information and technology leaders. 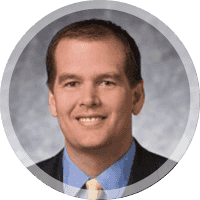 In Elmbrook, CIO Chris Thompson encouraged teachers to select and test the technology that works best for them and their students and bring him their solutions. Since teachers have their finger on the pulse when it comes to new technology, the benefits of letting them choose the best portfolio platform to implement district-wide were huge. Once brought to his attention, Thompson needed to evaluate tools to ensure that solutions chosen by teachers could scale across the district. Leaders at Elmbrook were drawn to FreshGrade for its ease of use. Training time was not needed — even for younger students. At Elmbrook, the team believes that time should be spent on learning, not training on how to use tools. FreshGrade is the best portfolio tool on the market and can meet our needs from kindergarten through high school. Prior to implementing FreshGrade, Thompson had been seeking a solution for personalized learning. He had researched student portfolios for four years but had yet to find something that worked for both academic studies and the arts. 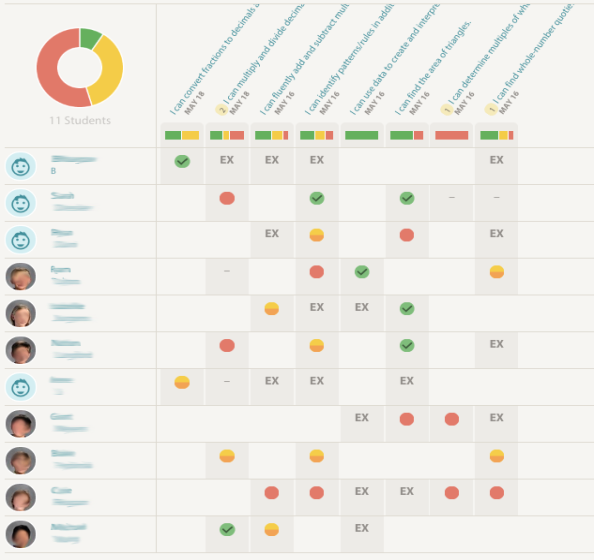 FreshGrade gradebook showing which activities students have chosen to do. Thompson rolled out FreshGrade across the district. Today, increased use of FreshGrade is greatest in middle and high school Art, Music, and Physical Education. 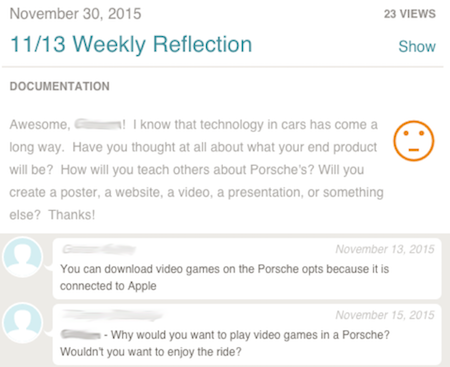 Example student reflection on FreshGrade portfolio. In her high school art classes for 9th-12th grade, Sarah Scott’s students use mixed media, ceramics, sculpture, drawing, and painting to express themselves and deepen their learning about the arts. Students are given time to work independently on projects and are asked to document their creative process. For Sarah, the integration of documentation began as an exercise where students took a picture every day. Students were encouraged to bring in their own devices, and initially, they documented their work using a variety of different methods. 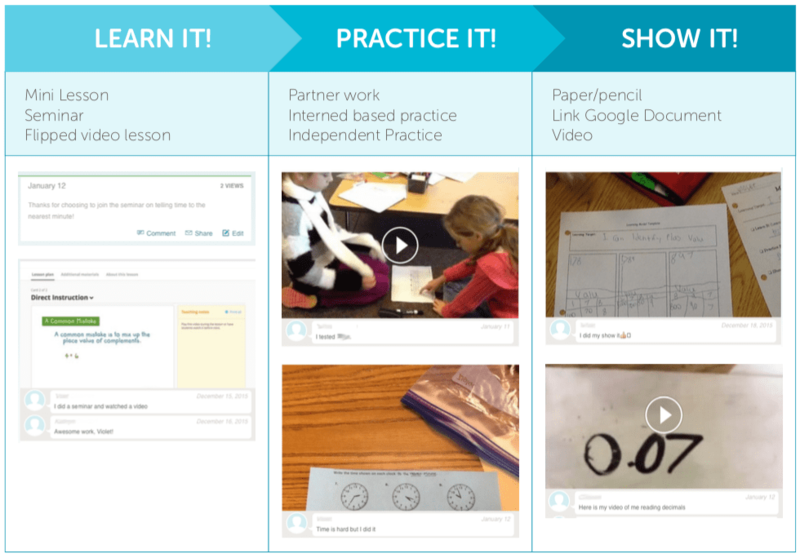 Shifting to FreshGrade, Sarah discovered a better way to empower students to capture and own their learning. Students were introduced to the platform and invited to document their day by answering two questions, “What are you working on?” and “What does your day look like?” Sarah and her students took their practice a step further by answering a series of reflection questions, either choosing one reflection question or being assigned one to answer each day. Example reflection from a student portfolio. Using FreshGrade also helps Sarah get to know her students better. With all of their communication in one place, it’s easy for students to post questions and comments when it works for them, and for Sarah to view and respond to them. 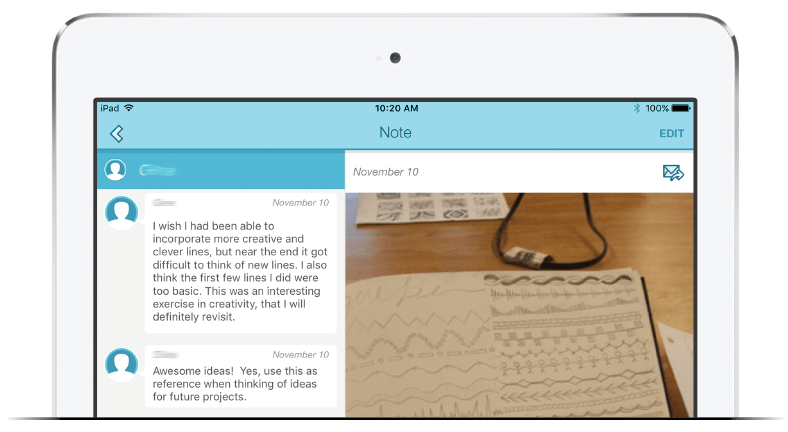 “FreshGrade creates another dialogue beyond the classroom. It starts a conversation more than email does,” she says. 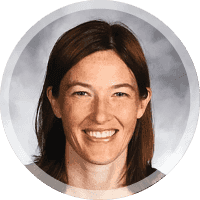 In class, Sarah can pick up on visual cues that students are struggling or excelling, but comments from students in FreshGrade provided her with a different perspective. Some students who were working very successfully were struggling internally with their creations and creative process. Sarah now uses those insights to directly address some of the general challenges for the group or the more specific challenges faced by individual students. As a result of using FreshGrade, students in Sarah’s classes are now documenting their work daily and sharing more through the platform than there is time for in class. 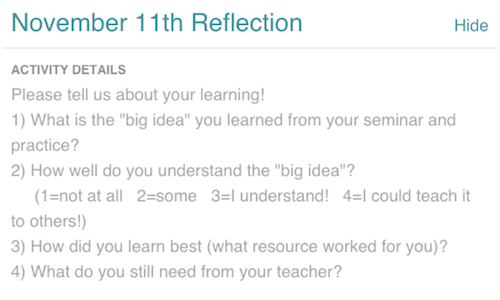 Students are thinking more critically about their own work and using self-reflection to evaluate and enhance their learning. Sarah tells them, “it’s like your social media use.” This workflow is very positive for Sarah as it provides her with access to the student’s progress, pictures, and reflection. Students have bought into the process and like being able to see their past work as well as the evolution of their creative process. 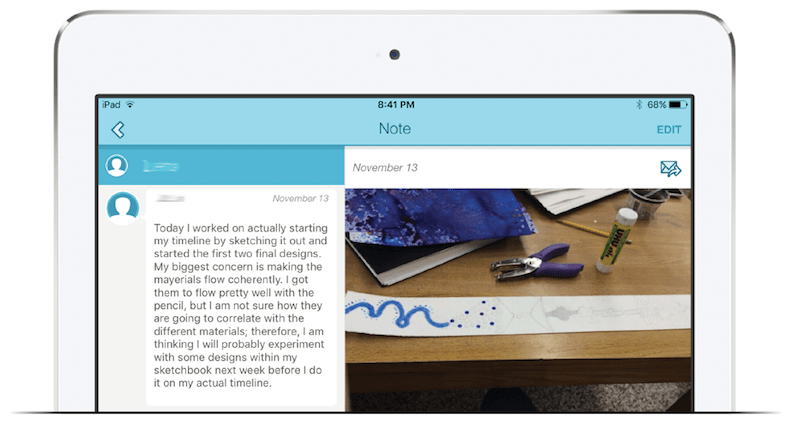 FreshGrade creates another dialog beyond the classroom. It starts a conversation more than email does. With teacher and student engagement increasing, Katie and her team started creating activities in FreshGrade to push information and lessons to students, then asking them to reflect on their learning by asking questions such as “What did you do today?” “How well did you use your time?” “What do you need from your teacher?” Not only does FreshGrade help identify what students need, but it also empowers students to see how they are progressing and gaining independence. Example parent and student communication.